Captain Hezekiah Coffin commanded the first American ship to round Cape Horn. He also commanded a Nantucket whaler the Beaver, which, after conveying a load of whale oil to England and returning with a cargo of 112 chests of British East India Company tea, was one of three vessels in Boston Harbour (the others were Dartmouth and Eleanor) which had their cargoes dumped overboard during the Boston Tea Party on the night of 16 December 1773. Tristram Coffin, my 8th Great Uncle, was co-Founder of Nantucket in 1659. Further, there are twelve kin that fought in the American Revolution and/or to find the Coffin – Parkman bloodlines simply search box this site at top right corner. The Boston Tea Party took place on December 16, 1773 on a cold wintery night in Griffin’s Wharf, a shipping lot where tea was imported and exported to all around the world. Some actions that took place during this event involved colonists who named themselves, “The Sons of Liberty,” expressing their anger through aggressive actions. These specific actions involved turning 340 chests of tea overboard to be steeped by the ocean. In todays currency, that amount of tea would be equal to about 1,700,000 dollars. The tea was found on three American built ships, however, the tea belonged to the British East India Company. The British Tea Company was accused to having a monopoly over tea sales in the American colonies. Patriots were outraged by taxes not only on tea but glass, lead oil, paint and paper too. A determined statesman named Samuel Adams organized a group of patriots “from all walks of colonial society ” to preform the systematic destruction of a Boston tea harbor. Figure 1. The Boston tea party in action. Looking closely you can see the intricate Indian costumes. Thesis Paragraph: One of the driving causes underlying the Boston Tea Party was “Taxation without Representation.” This is a situation when a government places taxes upon a group of citizens despite negotiating with the people, also lacking a representative to deliver opposing views when the taxation was being decided. American colonists were overwhelmed with anger, having the fate of their tax burden being decided from a group of irrelevant people living across seas, people whom lacked the exposure to see the conditions of a colony they were making important decisions for. It was greed and ignorance that led to the controversial taxation decisions made by the British government at that time. The British East India Company enforced an unfair tax scheme to be paid at Americas expense, while increasing the East Indian Company’s revenue. Colonists wanted to “challenge the status quo”  with the acts of the Boston Tea Party, and indeed they made a huge impact on the entire British empire in order to gain independence and have a right to “govern their own affairs.”  Why did the Patriots want to declare their independence so bad? Because their entire purpose was focused around a philosophy called republicanism. This was a huge factor in developing the America we know today. These people fought so hard because of what this philosophy stood for. Liberty and unalienable rights snapped the participants values. This philosophy also excludes “inherited political power.” It stresses the aspect of citizens being independent and responsible for their own decisions. The Boston Tea Party was a major event that played a key role creating American’s values today, also it began the tipping of dominos eventually leading to the American Revolution. “The specter of taxation without representation haunted the American Colonists.”  Tax was purposefully meant to regulate trade, increase public spending on goods and services, or improve the life and surroundings of the colonies citizens. Instead, people were fearful that the intensions of these new taxes were purely for the “purpose of levying money upon”  them. Citywide boycotts of British imports spurred violence seen in various newspaper articles, or even on the shipping ports themselves. Without representing the publics opinion on the new taxes set in place, the colonists had no other way to express their uproar of disagreement than to create a powerful group to help each other conquer the unfair burdens set upon them. Other problems arose within the time before the Boston Tea Party that stirred disagreement. One of them being the Townshend Revenue Act of 1767. This act was passed by English parliament, allowing the government to collect revenue from American colonists through tax on previously mentioned items. Many viewed this act as an “abuse of power,” citizens claimed they believed this was theft. Three years later parliament repealed all taxes except on tea, giving a temporary period of peace between “the two sides in the years before the American Revolution.”  The era of peace abruptly ended with the placement of the 1773 Tea Act. This act granted a now illegal position for the British East India Company to have a monopoly on tea sales in order to correct tea surpluses. As prices rose so did the assemblage of the Sons of Liberty. Figure 2. The Sons of Liberty in action. “In all free states, the constitution is fixed; it is from thence, that the legislature derives authority; therefore, it cannot change the constitution without destroying its own foundation,”  states Samuel Adams, leader of the Sons of Liberty. Adams implied that the government has indeed gone against its own rules set in place. He pointed out that the tea act was an unfair government bailout “for a company on the brink of financial collapse.”  Samuel Adams possessed a passion for liberty and strongly believed in self government, he demonstrated this clearly through his leadership of the Sons of Liberty. “In the years between the resistance to the stamp act and the outbreak of the revolutionary war, many Americans began calling themselves “Sons of Liberty.”  The name Sons of Liberty was derived from a conference meeting about the Stamp Act. Their beliefs supported effective resistance towards British governing in America. They believed that the British had established unfair taxation. They effectively overpowered British ruling. With their great success, the motivation only grew stronger to establish complete independence, later known as the American Revolution. How exactly did the Sons of Liberty gain the upper hand over the British? This is where the Boston Tea Party fits in the puzzle, starting on the night of December 16, 1773, the Sons of Liberty preformed one of the best choreographed group robberies of all time. Hundreds of men were apart of this event. 116 people documented, but hundreds more left out of the equation for fear of punishment. Most of the men, from Boston, fled Boston after the destruction of the British tea in fear of arrest. During the attack, the Sons of Liberty dressed up as American Indians in an effort to hide their true identities. “It was now evening, and I immediately dressed myself in the costume of an Indian, equipped with a small hatchet… and marched in order to our destination.”  Three American ships were dominated by these men. 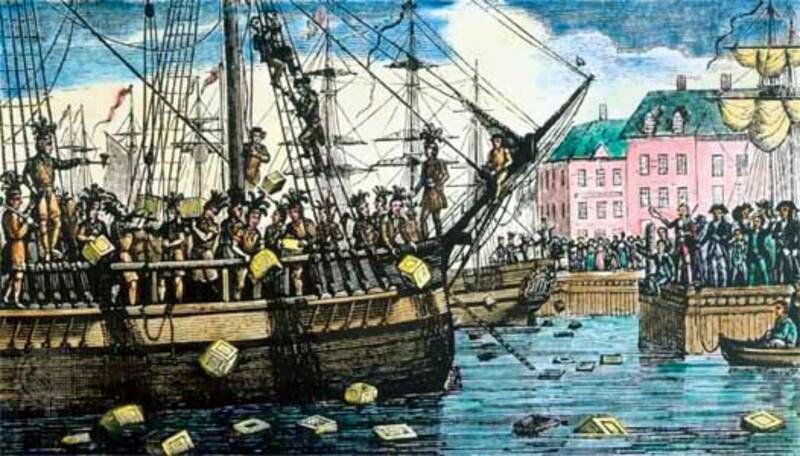 92,000 pounds of tea were smashed open with axes and poured into the Boston Harbor. However, the Sons of Liberty were careful to not damage anything but the tea, none of the ships were harmed. These people wanted to demonstrate their unhappiness with British Law, they knew what was happening was unfair to them, and it was. The British East India Company knew they were taking out their wrongs on people who had done nothing but right, and they paid the cost of undermining the power of the people. Figure 3. Samuel Adams, the leader of The Sons of Liberty. This entry was posted on June 12, 2009 at 2:56 pm and is filed under Uncategorized. You can follow any responses to this entry through the RSS 2.0 feed. You can leave a response, or trackback from your own site.